The TV news is pretty scary at the moment, with constant images of powerful men shouting about terrorist threats and violent crime. Truth is, we’re actually less safe from ourselves than religious extremists and axe murderers. Medically, we’re facing an obesity crisis with all sorts of related illnesses and we’re pretty good at falling off ladders and getting run over by cars too. Thankfully, when these things happen, medical support is within close reach and emergency services like 999 in the UK or 911 in the US are accessible via our phones from almost anywhere. In the UK, if your network supplier is out of range, any available network is legally obliged to service your emergency call. But what if you’re not well enough to make a call. Worse still, what if you’re unconscious? Ten years ago, it was popular to have an ICE number in your contacts. Short for ‘In case of emergency’ a Good Samaritan could look it up on your phone, contact your nearest and dearest and get help from there. Since then, we’ve all put our entire lives on our phones and all that data is (or at least should be) locked up safely behind a pin code or fingerprint reader. So how can you make your ICE details easily discoverable in an emergency on your phone? Well, it’s easy actually, but I didn’t know until recently and neither has anyone I’ve mentioned it to. 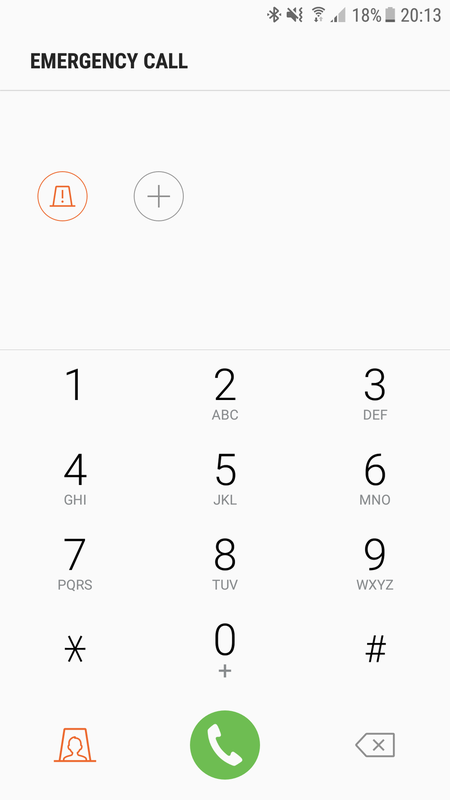 Switch on your phone and, without unlocking it, bring up the dialler. See the ‘Emergency Call’ button? Press it, don’t worry - It’s not a direct call button. On your Android phone, there’s now a dialler to which you can immediately get on to 999 or 911 etc. But notice down on the bottom left? There’s an emergency information button too. On the lock screen of an Android phone, you'll see an 'Emergency' option - pressing it does not immediately call 999 or 911! This is where you can share emergency medical information that your saviour can use to help you more quickly. For example, you might be deaf or mute, which would explain why you’re not able to respond in a way they might expect. Or perhaps you’re allergic to penicillin. Your hero could mention this to the Emergency Operator or the Paramedic and save you a world of hassle. To complete the information, simply go to your ‘Contacts’ app, open ‘My Profile’ from the menu and then select ‘Emergency Medical Information’ (Note: The latest version of Android, 'Nougat' has its ICE settings in Contacts >> Groups). Now, when your saviour opens the emergency dialler, there are links to your ICE contacts and any medical information that you've chosen to share. Wake up the iPhone and press the ‘Home’ button at the bottom. If the owner has locked it, you’ll see the request for pin entry and an ‘Emergency’ button at the bottom left. Tap on it and the dialler appears, ready to call your local emergency services number. If the owner has chosen to disclose medical information, then ‘Medical ID’ will appear at the bottom left of the screen. Tap it and the medical information will be displayed. 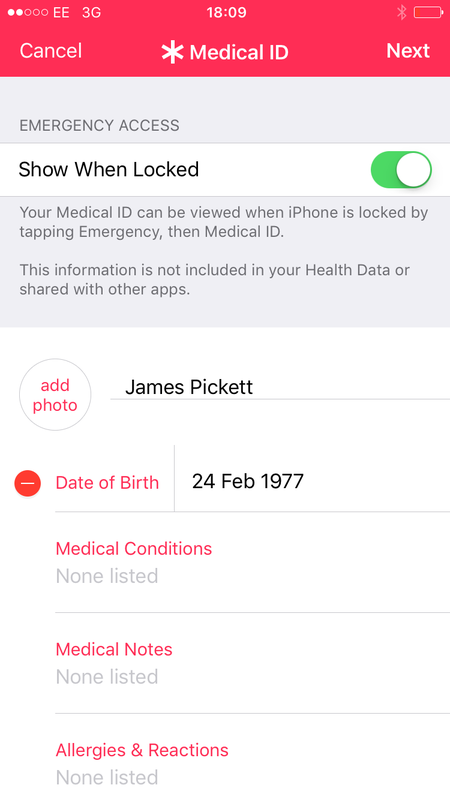 If you want to setup this information on your own iPhone, then open the ‘Health’ app, tap ‘Medical ID’ at the bottom right of the screen and then ‘Edit’ the settings. Fields include ‘Medical Conditions’, ‘Allergies and Reactions’, ‘Blood Type’ and ‘Organ Donor’ statement. Today your smartphone is something you’d likely to remember to bring with you ahead of a wallet or purse. If you’ve got a medical condition that you would want known in an emergency situation, then these features are a potential life saver. For everyone else, having a way to share an emergency contact whilst the rest of your digital life remains protected is another layer of safety in a scary world.